Ill-considered of course but then he has drunk the Koolaid. This article makes the case for a complete overhaul of our whole vaccination meme and the sooner the better. Right now our population takes the whole vaccination meme on faith originally built knocking out childhood diseases that were vulnerable to this approach. None of that really applies to what has been added on. Vaccination is a useful tool against an incipient epidemic where the opposing risk is acceptable. Against no such situation, you produce an epidemic of vaccine injury. Dear Bill, thank you but no thank you, you are not a doctor or any kind of health professional so your opinions on potential health disasters and vaccines are not welcome. In fact, with your vaccine programs, a case could be made against you as being the greatest sponsor of medical and pharmaceutical terrorism on our planet. Have you counted how many have died from your insistence that no child be left behind from vaccines? The US government does and pays through the nose for vaccine damaged or killed children. Vaccines kill children in more than rare occurrences. In 1986, Congress officially acknowledged the reality of vaccine-caused injuries and death by creating and passing The National Childhood Vaccine Injury Act (Public Law 99-660) which requires doctors to provide parents with information about the benefits and risks of childhood vaccines prior to vaccination. Doctors are required by law to report suspected cases of vaccine damage. The Vaccine Adverse Event Reporting System (VAERS) — operated by the CDC and FDA. Bill you warn, "Millions Could Die" If US Doesn’t Prepare for Coming Pandemic. 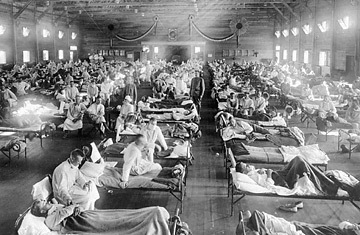 In your Washington Post interview, you say that should a deadly pandemic comparable to the 1918 influenza outbreak reach the US in the relatively near future, the US government would be powerless to stop it. And likely, hundreds of thousands – if not, millions – of Americans will die. You and your wife Melinda, have repeatedly warned that a pandemic is the greatest immediate threat to humanity yet you say not a word about the threat of plunging temperatures, near future agricultural problems that are already resulting from that, the absolute insanity of the worlds bankers with the hundreds of trillions of debt they have created, nor the absurd politics in Europe and the United States that threaten nuclear war with Russia. Australia’s chief medical officer Jim Bishop said health professionals should immediately stop immunizing children under five years old with the flu vaccine. Professor Bishop is concerned about a spike in the number of West Australian youngsters experiencing fever and convulsions after getting the shot. Without shame or warning you promote vaccines no matter how many nasty chemicals and heavy metals they contain. You say not a word how vaccines are contributing to autism rates that have broken down recently to 1 in 59 children and even worse in New Jersey. So, what should the US do according to you? The nation needs to prioritize the development of better vaccines – including a "universal" flu vaccine even though it presently is the only vaccine in the USA loaded with thiomersal, which is a highly toxic form of mercury. I guess you have not read information from real doctors who would warn against your idea for a universal flu vaccine. In your remarks you highlighted scientific and technical advances in the development of better vaccines, drugs and diagnostics that you believe could revolutionize how we prepare for and treat infectious diseases moving forward. "So, we need to invest in other approaches, like antiviral drugs and antibody therapies that can be stockpiled or rapidly manufactured to stop the spread of pandemic diseases or treat people who have been exposed." You sound like a cheerleader for mainstream medicine. "We know that it is coming, but we have no way of stopping it," said WHO infectious disease specialist Dr. Sylvie Brand. You undoubtedly believe the same demonstrating your ignorance of medical history and the many natural solutions to infectious diseases like sodium bicarbonate (which saved lives in the 1918 Spanish Flu epidemic), iodine, selenium and now Hydrogen Medicine, which would insure most people with bad cases of flu would not die because it is the perfect ICU gas to administer for sepsis. Considering that America is the most vaccinated country in the world one would think that the American children would be healthy, but they are not and you know that Bill unless you are the wealthiest ignorant man in the country. The fact is that vaccinated children suffer with more chronic illness than non-vaccinated children. Bill, if you are open to learning anything about medicine before the next time you open your mouth I would like to direct your attention to iodine. Though it kills 90 percent of bacteria on the skin within 90 seconds its use as an antibiotic has been ignored. Iodine exhibits activity against bacteria, molds, yeasts, protozoa, and many viruses; indeed, of all antiseptic preparations suitable for direct use on humans and animals and upon tissues, only iodine is capable of killing all classes of pathogens: gram-positive and gram-negative bacteria, mycobacteria, fungi, yeasts, viruses and protozoa. Most bacteria are killed within 15 to 30 seconds of contact. If you can understand why iodine is used by the gallon in hospitals, you would be able to see that iodine is a much better choice than the flu vaccine. I do not suppose you know that viral infections are pH sensitive. Certain viruses (including the rhinoviruses and coronaviruses that are most often responsible for the common cold and influenza viruses that produce flu) infect host cells by fusion with cellular membranes at low pH. Thus, they are classified as "pH-dependent viruses." On May 4, 2011 a study by Neil Z. Miller and Gary S. Goldman was published online by SAGE, entitled “Infant mortality rates regressed against number of vaccine doses routinely given: Is there a biochemical or synergistic toxicity?” This study is another in a long line of studies revealing evidence showing the more vaccines a baby receives, the more chance they have of dying from sudden infant death syndrome (SIDS). Deception can be deadly in medicine and nowhere is that more evident than in the vaccine industry and cancer areas. I imagine you are too arrogant to reconsider your position, so no one will expect you to. That is a shame and that is what you will be remembered for.